We had an amazing time, all 12 of us were so so happy. Booking Maria (for the chef service) was an excellent idea she really made the difference, she was super. Thank you for opening your doors to us, your home is fantastic and the atmosphere was 100% laid back like we needed. Fuimos por motivos de trabajo y pasamos una semana maravillosa y tranquila. El paisaje es maravilloso, relajante y una fuente de inspiración. Pudimos trabajar muy bien en los diferentes lugares de la casa y descansar después de la jornada laboral. La masia es muy acogedora, amplia, limpia y está bien ubicada, a solo 30 minutos de Barcelona y a unos minutos de Sitges. La decoración y el mobiliario son encantadores y de buen gusto. Tiene todos los servicios necesarios: lavadora, secadores de cabello en cada baño, toallas y un canasto de bienvenida. Es un lugar ideal para pasar unas lindas vacaciones, celebrar en familia e incluso trabajar con el equipo de trabajo. La comunicación con los dueños fue excelente, respondieron rápidamente a todas nuestras preguntas, muy atentos y flexibles. La ayuda del personal local fue extraordinaria, siempre estuvieron atentos a cualquier detalle y fueron muy serviciales, la comida también fue estupenda. Gracias a todos por hacer de nuestra estadía una semana inolvidable! Thanks, it was a wonderful stay and the house is amazing. The house was so comfortable and thoughtfully stocked. Thanks for the welcome basket! We really appreciate the convenience of things like beach towels, pool toys and hair dryers. Coming from the US with our small suitcases those are the items we can’t bring and it really made our stay nice. A couple (very minor) suggestions next time you shop for the house: a larger drip coffee maker and a really large salad bowl. (Of course we’re Americans and we like everything big!). I’ll certainly write a review, I loved the place. As I said in the first place we wanted somewhere where friends could visit, not least to see one of our daughters who was over from Australia for the first time in 18 months. It was perfect and allowed lots of people to come and go for short times. lovely meals overlooking the valley. Enjoyed the cycling in the garraf but barely scratched the surface of what was available so may need to come back!! Many thanks for letting us have the place. Yes we all had a wonderful time at the house, the villages surrounding the place and the beaches down in Villanova! We had good dinners outside on the terrasse and used the BBQ well and even prepared an amazing Paella! 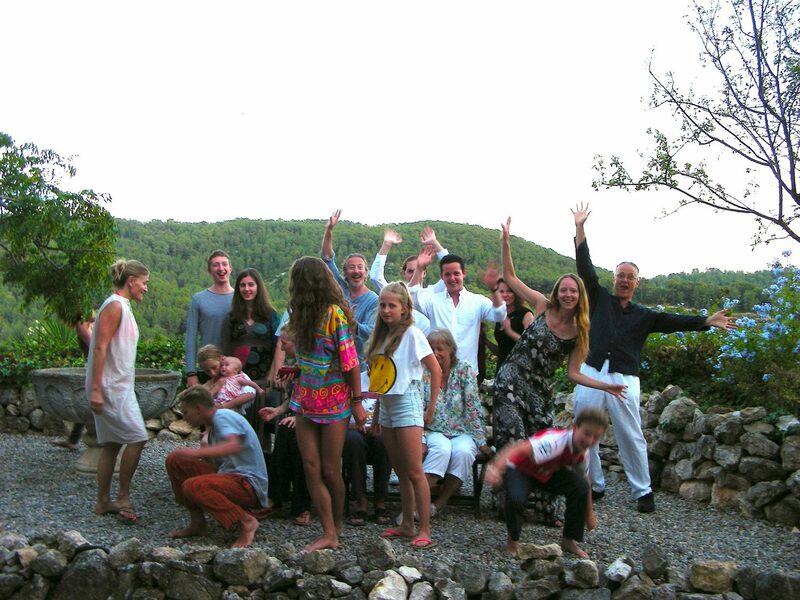 We all enjoyed the stay at Can Marcer very much, our kids talk about the best summer vacation ever. The youngsters loved the swimmingpool, so did we. After a lovely week at Can marce I wanted to write to you. We arrived at your lovely home which was so nicely decorated it was a pleasure to sit inside, even when the weather was (initially) bad. We even had hot water bottles on the beds! It is a very child friendly house which made the kids feel very welcome. The water of the pool was clean and nicely warmed up. We treated your beautiful belongings with care and left the house neatly. Unfortunately we broke one wineglass. We very much enjoined your house and its surroundings and hope to visit again in the future. Thank you very much for your hospitality and good care. This is our final evening at the house, and the whole family would like to tell you how much we have enjoyed our time here. The house is just great, and is maintained at the highest level. It has all the amenities we could ask for – nothing is missing, and more. We enjoyed the kitchen, the living rooms, the pool (yes, we were sitting by the pool on Friday, and some of us actually spent time in the warm water), the library, the videos, and more. I assume we should thank you for the great weather too – everyday it got better and better. In short, it was a great vacation in one of the best houses we’ve ever had. Happy new year! We Had a wonderful time at your House. My family just loved it! We Had lovely, lunches outside with the stunning views and nice walks! Your House is amazing as it is nice and cosy for 4 as for 16 people or more, which is quite exeptional. And more amazing is that even with 8 kids we had a quite stay in the living as the kids were playing in the ping pong room or playing a game in the up stairs living. Just great!!! !we would love to come again! Still readjusting back to our home time zone, but we are back from our AMAZING trip. Just wanted to take a minute to say thanks again for renting out your beautiful home. We all had such a wonderful time being at the same house together. The kids had a blast exploring (outdoors and indoors!) and swimming, and having dinners outside all together was such a treat. Barcelona and Sitges were both beautiful. We were all really impressed with the country from the parts of it that we experienced. Thanks again! Je n’avais pas encore lu votre message, ayant profité de la maison, de la piscine, du jardin, de la mer et du soleil jusqu’ici ! Nous sommes merveilleusement installés. La maison est très belle et très agréable. Les enfants sont ravis (ping-pong, billard, piscine, plein de jeux dans la maison…). Nous passons donc d’excellentes vacances !